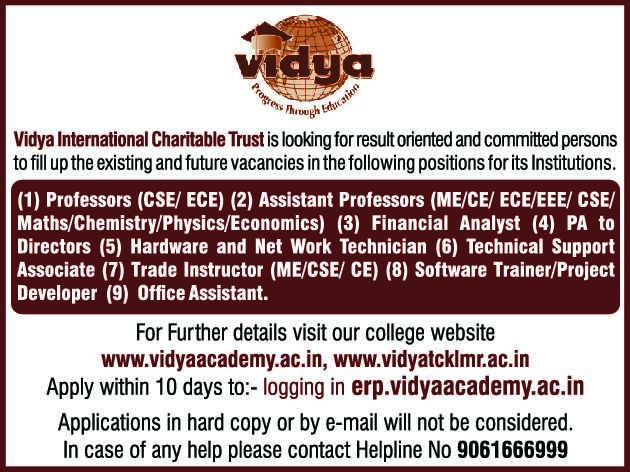 Vidya Academy of Science and Technology, Thrissur has advertised in THE HINDU newspaper for recruitment of Teaching Faculty- Professor / Assistant Professor Plus Non-Faculty jobs vacancies. Interested and eligible job aspirants are requested to apply within 10 days from 10th April 2019. Check out further more details below. About College: Vidya Academy of Science & Technology (VAST) is a state-of-the-art engineering college conforming to international standards. This model engineering college is approved by AICTE vide approval NO./06/ KER/ENGG/2002/91 dated 12/05/03 and affiliated to APJ Abdul Kalam Technological University. In few years VAST has evolved and achieved recognition as a notable School of Engineering with its competent and committed faculty, high quality infrastructure and high technology teaching aids, and by providing a serene atmosphere that complements academic life. VAST has a holistic approach to education where academic training goes hand in hand with offerings that develop the body,mind and soul to prepare its graduates to be future leaders.